Chad Strentz is one of the hardest working frontmen in the British blues scene, and you may be familiar with his work with Paul Lamb and the King Snakes, who has earned numerous British Blues Awards, including UK’s Best Blues Band. He has music deep down in his soul, having started playing guitar and singing in his early teens while taking inspiration from all the right artists: Elvis Presley, Johnny Cash, Ray Charles, Little Richard, Big Boy Crudup, and Bo Diddley, to name just a few. After gaining a firm foundation in rockabilly, he dove deep into the blues that he practices each day, both with the King Snakes and his own band, the Chad-illacs. After decades of touring and recording, it is amazing that Chad had not cut a disc of his own before now. 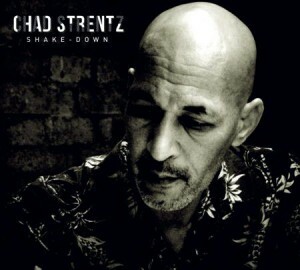 Shake-Down is Strentz’s debut album, and it was recorded in only three days at drummer/producer Mike Thorne’s Rimshot Studios in the English countryside. Chad and Mike were joined by a group of excellent musicians from all over Europe, including Jim Leverton on electric bass, Pete Pritchard on double bass, Christian Rannenberg on piano, and Raphael Wressnig on the Hammond C-3. Jimmy Reiter and Kai Strauss shared electric guitar duties and British acoustic blues guitar giant Danny Kyle sat in on this session as well, which is a real treat! This disc clicks in at just under an hour, and it includes 15 tracks that are made up of eight Strentz-penned originals and seven really cool covers from some of the artists that have inspired him. Listening to his own songs, it is obvious that Chad is not just a gifted singer, but also a very talented songwriter that has a good feel for American music. The title track kicks things off with up-tempo 1960s soul that has plenty of organ and razor-sharp vocals from Strentz, and this sets the tone for the rest of the album. After this first song, it is apparent that Shake-Down has a raw and vibrant feel, which is intentional as it was decided to record it live with few (if any) overdubs, and with only tube amplifiers and analog recording equipment. Strentz wanted to honor the music he listened to as a youth by recreating its sound and vibe as genuinely as possible, and it all came together beautifully. This tribute continues over to his choice of cover songs, as well. These include Ray Charles’ “Hard Times,” “Hey Porter” from Johnny Cash, and the jazz standard “Paper Moon,” complete with boogie-woogie piano and a healthy dose of carnival organ laid over the top of it. On the more obscure side of things are Cowboy Jack Clements’ “It’ll Be Me” and Clarence Carter’s “Someone You Use,” which you may remember from Vonda Shepard’s Ally McBeal soundtrack recording. But the strongest of these is the most pared down: a gorgeous remake of the Miracles’ “Tracks of my Tears.” Chad does an admirable job of living up to Smokey Robinson’s original lyrical style, accompanied solely by Kyle’s subtle acoustic picking. The set ends with a favorite, “Always on My Mind,” one of the most-covered songs ever (and rightfully so). Though Willie Nelson did a bang-up job with it, the Elvis Presley version defines this song and that is exactly where Chad went with it. The highlight is when Wressnig lays down a sweet Hammond organ break that fits perfectly with the emotional timbre in Strentz’s voice. Please note that if you are patient, after this song ends there is a killer hidden vocal/acoustic howling blues song that should not be missed. Shake-Down from Chad Strentz is a winner, with 15 solid tracks that are an enjoyable mixtures of blues, soul, and the foundations of rock and roll. His decades of performing and recording have taught him how to do things right in the studio, and it is apparent in this release. Check out a copy for yourself, and see if you agree!